To build buzz for the new season, AMC recently “zombified” some famous celebrities in some gory and cool photos. If you look at the horror sites online, all you see is stuff from “The Walking Dead” so it’s safe to say there will be plenty of attention. AMC is just one of many cable channels that have been changing television with these quality dramas. The formula is much different from network TV, as here true artists are given the creative freedom to express themselves without focus groups and studio executives dumbing everything down. HBO led the charge years ago, and fortunately many others are following this formula. Now, the quality of stories is better on cable TV as compared to most major movie releases. Enjoy! Christina Hendricks Looks Amazing in Vivienne Westwood; Dishes on “Mad Men”! Christina Hendricks on “Dream Job” Mad Men: I Hope It Gets Settled Soon! 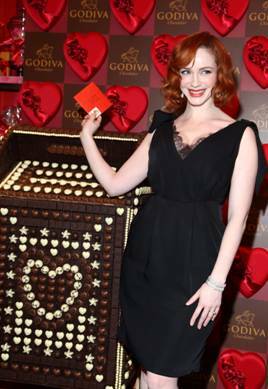 Christina Hendricks Sweetens Up Godiva Chocolate’s Flagship in NYC! This Valentine’s Day, Godiva transformed its new Fifth Avenue Flagship boutique in New York City into an unprecedented chocolate pop-up experience. 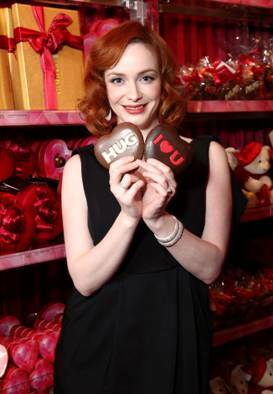 To celebrate the history of Godiva’s first signature store, “Mad Men” Actress Christina Hendricks unveiled a chocolate oasis and came to mail a love letter to her husband in Godiva’s chocolate mailbox today. She was wearing a Carolina Herrera dress and Judith Ripka jewelry. “Mad Men” star Christina Hendricks might be the sexiest redhead…ever. Best known as Joan from the hit AMC show “Mad Men,” the 35-year-old bombshell from Knoxville has been bouncing around television (no pun intended) for the last decade. And get this — she’s naturally a blonde, but has been dying her hair since she was 10 years old. Christina Hendricks Smolders in British GQ!